Alexander Callens celebrating his goal. USA Today Sports. 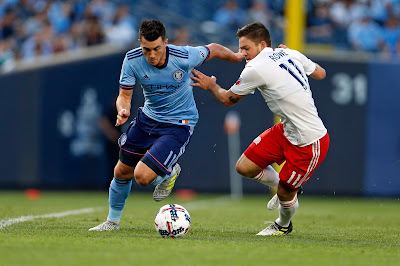 New York City Football Club rebounded from a tough draw with New England on Wednesday night with a thrilling 2-1 win over the Philadelphia Union on Saturday afternoon at Yankee Stadium. 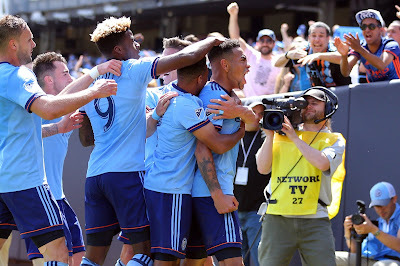 In the game Wednesday night, NYCFC surrendered a goal in the 86th minute, and on Saturday, they won it with two goals in the final 10 minutes. The pregame festivities before NYCFC took on Philadelphia on Saturday at Yankee Stadium. Photo by Jason Schott. In celebration of LGBTQ Pride Month, Hetrick-Martin Institute (HMI) and New York City Football Club 's charity City in the Community will partner to provide local teens a safe, inclusive space to openly discuss LGBTQ-specific topics through a pioneer series of HMI-led inclusivity workshops.